I don’t know about you, but whenever I hear that a business is owned by Christians and they conduct all aspects of their business as such, I love to support the business whenever and however I can. What are some Christian businesses (local or large companies) you like to support? Let me know in the comments below. 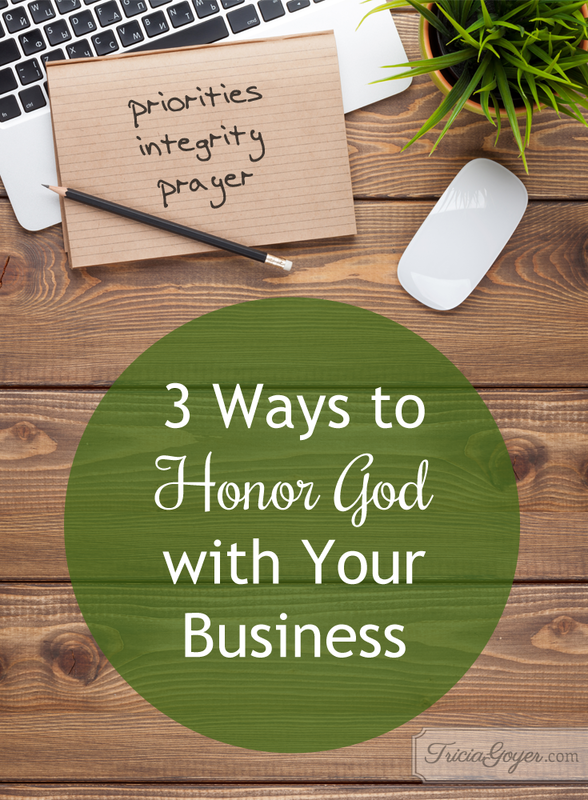 Then keep reading for tips on how to honor God with your business; even if you don’t own or run a business, these are great tips if you have a 9–5 job. Don’t miss an exciting giveaway at the bottom of this post, either! 1) It’s not just about money. Sure, you have to make money to keep your doors open—but you should view every person who walks through your doors as a ministry opportunity. You never know what relationships will form between you and your customers (or even other business associates) and how God will use that to glorify his kingdom. This might seem like an obvious one, but we’re prone to worry first and pray later, especially when it comes to our jobs. Even as I’m writing a book and coming up on my deadline, I tend to worry first and focus on that looming date, rather than giving it up to God to begin with. Remember, He has everything in His control when it comes to your business. Just pray about it! One business that doing wonderful things to honor God with their business is Pizza Ranch restaurant! They are a Midwest chain whose mission is “to glorify God by positively impacting the world.” One way they are doing just that is with the release of an original compilation CD titled “Living Hope.” It features some of the most celebrated names in Christian music, including Francesca Battistelli, Phil Wickham, Passion Band featuring Kristian Stanfill, Mark Schultz, Michael W. Smith, Bart Millard of MercyMe, and Matthew West. The songs, many of which are exclusive to the Pizza Ranch® record, echo a message of hope. You can purchase the CD here! To further impact Christian artists and their families, the organization donated $120,000 on behalf of participating artists to non-profit Porter’s Call. Porter’s Call works to counsel, support and encourage recording artists and their families. Pizza Ranch has graciously given me three CDs to give away to readers! Use the widget below to enter to win. Only those in the U.S. are eligible to win. *This post and giveaway are sponsored by Pizza Ranch. Thank you for supporting all Tricia Goyer collaborations. Looks like a great CD to have in your car. I go to Chick-Fil-A and In and Out. Both are owned by Christians. I did not know Pizza Ranch is owned by Christians. Thanks so much for that information, as we love to go there! I love to shop at Hobby Lobby and would joyfully work there as well. I have never had the opportunity to eat at Chick-Fil-A or In and Out, but will be on the lookout for them when we travel out of our area. Here in Texas, we support Chick-fil-A and Hobby Lobby. We also love In and Out Burger, but I didn’t realize they were Christian owned. Pizza Ranch sounds good. I wish we had some here. It’s very important that we support these businesses. Thanks for the article and giveaway!! I, too, support Hobby Lobby and Chick-Fil-A, and also Sims Pest Control, which is a locally owned Christian small business. Thank you for introducing me to Pizza Ranch! And thank you for the opportunity to win their CD! Chick-Fil-A, Hobby Lobby, Mardel’ s, and Mary Kay Cosmetics. We patronize Chick-fil-a and Hobby Lobby whenever possible. I support David’s Burgers, Chick-fil-a, Hobby Lobby. What a great article. Each one of those you mentioned are very important for Christian blogs or businesses. Thanks for sharing this helpful information. Gives me direction! Brilliant .Tx for sharing . We are a Missionary family in Africa ,and love it when people run their business by the Bible .In a world that is messed up with greed ,low ethics and morals ,integrity is almost non existence . We as Sons of God should have such a high standard and should be known for our honesty and love for Jesus . As times grow darker ,we should be a light in the world . Thank you So much for the uplifting post . Keep going for God . God Bless .Love in Jesus . Ben and Family ,Africa . Thank you for the good reminders. I’m in Texas and we also support Chic Fil A, Hobby Lobby, Lifeway, Mardels and we support Young Living. I have recently started my own business with Young Living because of how they run their business and the good they do for communities all over the world. One of the first things my upline said to me was. “Have you prayed about it?” ❤️ I’m excited to see where God leads us!